Do Liquid Diets And Cleanses Actually Help You Lose Weight? Thinking about going on a liquid diet or cleanse for weight loss? Here’s what the experts think. Liquid diets are often depicted as a quick fix, a shortcut that gives you dramatic results with little effort. Why put in work when you can drink your food and call it a day? Thanks to social media and celebrity endorsements, cleansing and detoxing has become more popular than ever. And more recently, a liquid diet was a major part of the plot in a popular television show. In Netflix’s Insatiable, teenage protagonist Patty drops a significant amount of weight thanks to a liquid diet she goes on after her jaw is broken and wired shut. When the wires come off and Patty can eat solid food again, the weight stays off too (a major plot hole) and she finally gets revenge on her bullies. Besides being problematic and offensive, Insatiable glamorizes a draconian, medically necessary liquid-only diet as a viable weight loss method. The reality of the liquid diet isn’t depicted, only the results. As a teenager, I also had my jaw broken and wired shut, and I can tell you this is not what happens when you drink your food through a straw for four to six weeks. So what do liquid diets actually do to your body and brain, and is there ever a healthy way to do them for weight loss? We spoke to two experts to find out: Dr. Michael Crupain, a board-certified preventive medicine physician and coauthor of What To Eat When, and Abby Langer, a registered dietitian and owner of Abby Langer Nutrition. Note: For the purposes of this article, a liquid diet is defined as replacing all or most meals with liquids for several days or longer. We aren’t talking about the occasional juice or shake for breakfast. This also excludes medically necessary liquid diets, which may be prescribed before or after certain procedures, or for medical conditions. Obviously, what’s in the liquid matters. A juice cleanse, for example, is typically very low in calories and higher in sugar, whereas meal replacement shakes may provide more protein and other nutrients. But for the most part, liquid diets tend to be lower in calories than your regular solid-food diet. “One common thread among all the liquid diets I’ve seen in the last 20 years is that none have adequate calories or nutrients to sustain a person over the course of weeks or even days,” Langer told BuzzFeed News. Most liquid diets are meant to take weight off very quickly, she pointed out. They may provide anywhere between 1,000 and 1,500 calories a day, depending on what and how much you’re drinking. When you go on a low-calorie liquid diet, you are essentially starving your body and forcing it to use up your stored energy. First, it starts burning through your glycogen, a form of glucose that the body stores in the liver and muscles. Glycogen also binds to several times its weight in water, the experts explained. “As you burn through glycogen you lose the water attached … and you store somewhere between five to ten pounds of water weight,” Crupain told BuzzFeed News. So yes, you can lose weight on a liquid diet in the beginning, but it’ll probably come back pretty fast. “As soon as you start eating food again, your body starts building up your glycogen again and with that comes the water, back,” said Crupain. 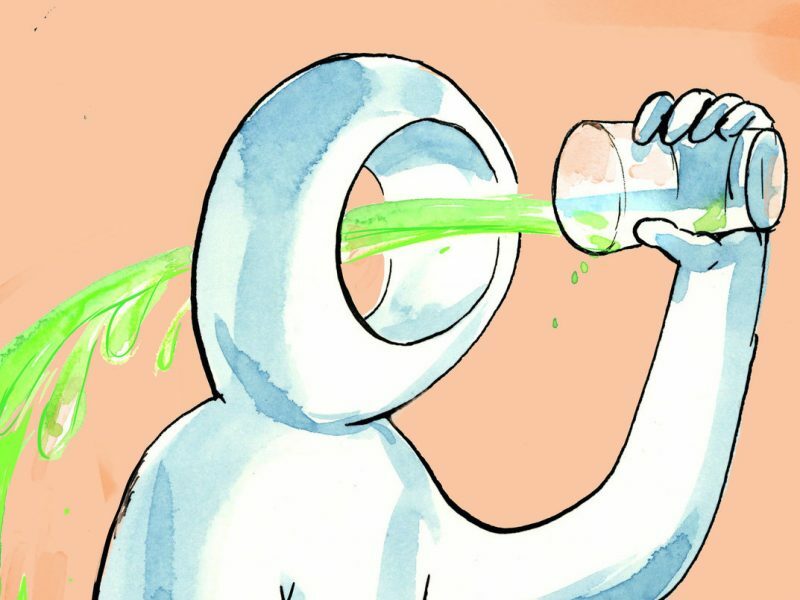 What if you’re on the liquid diet for longer? Once your body burns through the glycogen it will go to its longer-term energy stores: fat cells and muscle. So you can eventually lose some fat, but also muscle mass, which is hard to gain back. After you end the diet and return to solid food, you may also end up gaining more weight than you lost in the first place, Langer explained. Naturally, most people will have a tendency to overeat after ending a very restrictive diet. “Your body craves food and you overeat to compensate for the calories and nutrition you didn’t get while on the liquid diet,” Langer said. Depending on your body composition goals, this may not be ideal. So according to the experts, liquid diets are not an effective or sustainable weight loss method. “You may lose some weight but it’s very hard and you’re not getting all the fiber and vitamins and nutrients your body needs to work. … You’re starving yourself in an unhelpful way,” Crupain said. There are more sustainable, healthier ways to lose weight. What if you’re just trying to “detox” or “cleanse” your body? After all, that’s how a lot of liquid diets are marketed. Good news: Your body does an amazing job of detoxing itself, Crupain said. Your liver, kidneys, lungs, and lymphatic system (among other parts of your body) all work hard to remove toxins and impurities from your body and keep you healthy. Avoiding solid foods and opting for a liquid diet won’t “wash out” your digestive system, either. “There’s no way to power-wash your intestines, nor should you have to,” Langer said. Depending on the content of your liquid diet, you may actually be a little more backed up. “You will probably get constipated because you need fiber and aren’t getting enough from the diet,” Crupain said. However, some of the premade mixes, shakes, and teas that are marketed as detoxes can contain laxatives and diuretics that can be very dehydrating, Crupain pointed out. So make sure to read the label and use caution when trying any of these. There’s another reason why ultra-restrictive, low-calorie liquid diets are not a great idea: They can actually do harm to your mental health and relationship with food, according to the experts. “You’re creating this psychological misconception about dieting. … Losing weight shouldn’t be about depriving yourself of food and nutrition,” Crupain said. In most cases, going on a longer-term liquid diet will be pretty miserable. You’ll probably feel hungry, and hangry, all the time, and like you’re missing out on the experience of eating. “You’re reducing food into something that’s just fuel and taking out all pleasure. … This can cause psychological and emotional, even social issues,” Langer said. If you have a desire to go on a low-calorie liquid diet for a very long time, or repeatedly go on these restrictive diets, Langer said that this may be a sign that you should talk to a professional. According to the experts, if you have a history of eating disorders or you are concerned about your attitudes toward eating and your physical or mental health, you should definitely avoid liquid diets (and all fad diets in general). In any case, talk to your doctor before you plan on making any big diet changes.